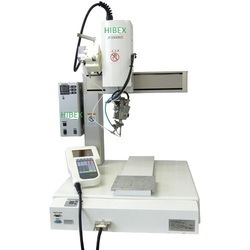 Wholesale Trader of a wide range of products which include janome pcb depaneling robot, soldering robot, janome cartesian robot, janome scara robot, automatic screw tightening machine and automatic dispensing robot janome. By keeping our synchronization with the current market trends, we are occupied in offering a wide range of PCB Depaneling Robot & Machine. 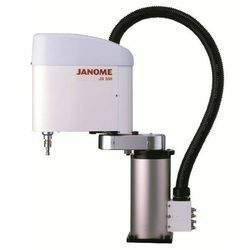 The multifunctional JC-3 Series Cartesian Robot comes complete with an easy-to-use dedicated controller and robot unit with a rich selection of stroke lengths for each axis. Our specialized Screw Tightening Specification and Dispensing Specification software greatly shortens your program setting time for either screw tightening or dispensing applications. We also offer highly versatile Standard Specification software. 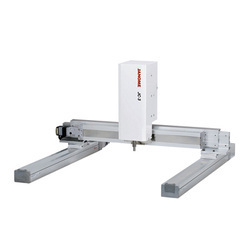 The JC-3 Series uses feedback control stepping motors on the X and Y axes to carry a load up to 8kg, with a maximum acceleration of 5000mm/s2 and a top speed of 800mm/s. An Ethernet port (LAN) and 3 COM ports (RS2323C) are included as standard equipment. Install an optional Fieldbus port (available types: CC-Link, DeviceNet, PROFIBUS, EtherNet/IP, PROFINET and CANopen). Not only can you specify a program number and run it from the PLC, you can also specify position coordinates and move the robot axes, as well as rewrite the position coordinates in existing programs. In addition to our helpful position correction function, we've added functions such as an automatic calibration function and a CCD camera adjustment function. Teach up to 2 stepping motor or servomotor-driven "pulse string input type" external devices from the teaching pendant the same as with the robot axes. This function has many uses so you can "Set up a turntable to change the direction of the workpiece", "Set up a conveyor and control it from the robot", and more. Using our dedicated application software, teaching is easy for both "Screw Tightening Specifications" and "Dispensing Specifications". Create teaching data based on DXF files or Gerber data using "JR C-Points II" PC software. We offer an optional teaching pendant for teaching via JOG movement. To help personnel from a wide variety of countries operate the robot, we have 11 teaching pendant display languages built-in. You can choose from among : English, Japanese, French, Spanish, Italian, German, Korean, Simplified Chinese, Traditional Chinese, Czech and Vietnamese. JSTH Series: seven models ranging from 350mm to 1,000mm.Powerful motor (up to 1,900W) handles high speed operations. Various Model Sizes, 4 different arm lengths, ranging from 250mm to 550mm. Clean Room Compatible Models,Compliant with Clean Class 10* ¿¿¿*Federal Standard 209D¿¿¿Special airtight structure and built-in inside-out vacuum system prevent dust buildup. 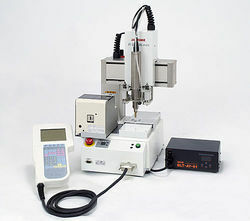 Various Model Sizes,7 different arm lengths, ranging from 350mm to 1,000mm.Long versions of the Z-axis are available for the JS550TH and JS1000TH models. Smooth Wiring Layout,Z-axis shaft's hollow construction keeps the cables for tools and other external devices attached to the arm tip from getting tangled. 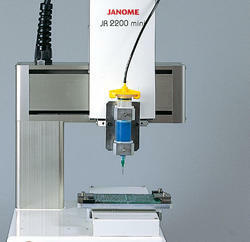 Original Software "JR C-Points" Dedicated software for screw tightening, dispensing and soldering jobs. Customizing Function.This allows you to register job data as a functional system and then create your own software by making your own settings. Ample Programming Capacity.Create up to 255 programs with up to 30,000 points of data. 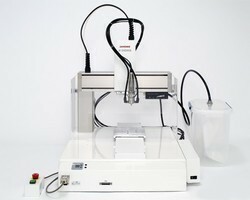 Simple Sequencer.The built-in simple sequencer works independently from the robot's operation, carrying out up to 100 programs or 1000 steps. 10 different display languages.You can switch from among these languages: Japanese¿¿¿English¿¿¿German¿¿¿Italian¿¿¿Spanish¿¿¿French¿¿¿Korean¿¿¿Simplified Chinese¿¿¿Czech¿¿¿Vietnamese. Choose different measurement units.Switch between coordinate values displayed in either mm or inches.